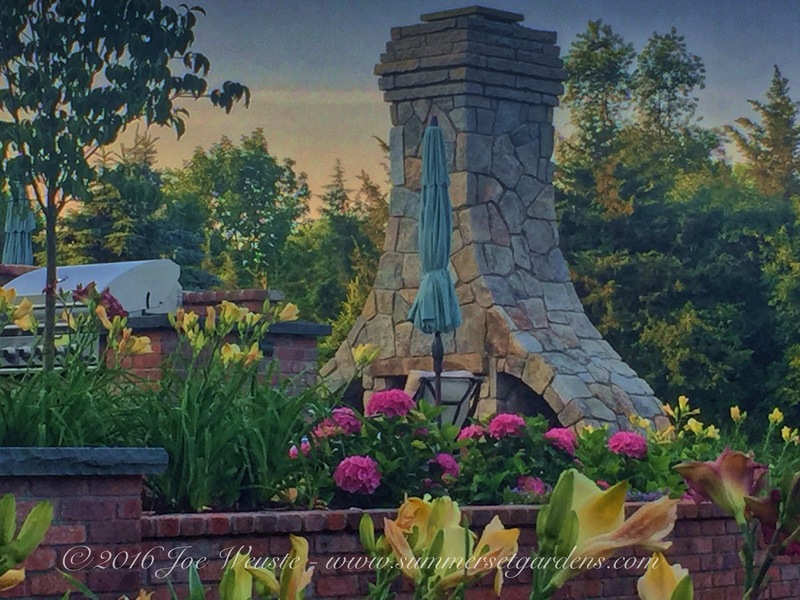 A backyard landscape architecture project located in Warwick, NY. This project features extensive masonry work using weathered brick, bluestone, granite and precast stone. Features include an outdoor kitchen, bar, fireplace, several patios, steps, landings, decorative garden gates, trellis panels, fencing, outdoor lighting, and extensive plantings. To the right, you can catch a glimpse of the granite outdoor fireplace. Great care and workmanship were required to make the curves. Casual lounge chairs from Restoration Hardware sit on a small dry laid bluestone patio. In the background, you can see the dining area and furniture which sits on a patio built with a combination of brick & bluestone. A small weathered brick and bluestone seating wall frames the back corner of the dining patio. To the left, you can catch a glimpse of the granite outdoor fireplace. Great care and workmanship were required to make the curves. Furnishings from Restoration Hardware sit on a small dry laid bluestone patio. I used weathered brick for the outdoor kitchen and bar. A thick dark granite was used for the bar top. I installed a curved trellis panel to break up the house facade. I am currently training some climbing roses to cover the trellis. Attention to detail.... I used a combination of traditional clay brick and bluestone for the patio. These materials are timeless. A ceramic bird sits atop a carefully placed boulder. The plantings have been designed to provide color from April through October. Some of the plants used are Rhododendron, Astilbe, Sweet Woodruff, Blue Star Creeper, Salvia, Daylily, Shasta Daisy and Carpet Bugle. A grove of white Birch trees under planted with Rhododendron and several varieties of Hydrangea. I tucked a stone bench into the planting bed. Some perennials that I used, are Allium, Iris, Shasta Daisy, Catmint, Salvia, Anemone, Thyme, Phlox, and Astilbe. A raised backyard living area supported with a weathered brick retaining wall. Stone steppers lead down to the swimming pool area. A small nicely furnished bluestone patio is placed in front of the outdoor fireplace which cannot be seen but is to the right of the patio. To the left, you catch a glimpse of the brick outdoor kitchen. For the plantings, I used a variety of Sedums, Phlox, Shasta Daisy, Daylily, Hydrangea, Scabiosa, Iris & Dogwood. A view of a small stepping stone path off the bluestone and brick dining patio. To the right is a weathered brick seating wall capped with a rock faced bluestone coping. For the plantings, I used Blue Star Creepers, Carpet Bugle, Salvia, Leucanthemum, and Rhododendron. Warwick NY residence. The treads are constructed with a 2" thick rock faced bluestone. I used a custom color blended mortar for the brick joints, slightly recessed. Below is a detail of the walkway. It is constructed with a weathered clay brick, bluestone borders and randomly placed blue stone inlay. Hybrid Rhododendron help to visually soften the steps. 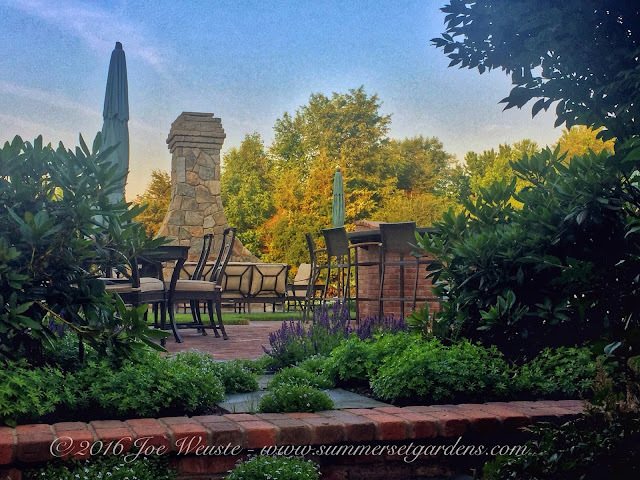 A weathered brick retaining wall and lush plantings surround this Warwick NY backyard living space. A bluestone stepping stone path leads to a weathered brick and bluestone dining patio. To the right is an outdoor kitchen and bar. In the rear of the space is a granite outdoor fireplace with a small bluestone patio to accommodate the lounging furniture. The plantings in the foreground consist of Sweet Woodruff, Isotoma, Salvia & Rhododendron. A weathered brick and granite outdoor kitchen and outdoor fireplace. The living space is surrounded by a weathered brick garden wall and plantings. The plantings consist of Daylily, Dogwood, Carpet Bugle Hydrangea and Norway Spruce for privacy.